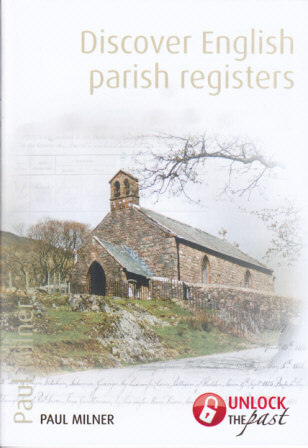 I’m pleased to announce that copies of my latest book – Discover English Parish Registers are now available in both print and electronic formats. It is published by Australian publisher Unlock the Past. You can purchase the e-book here for AUS$7.95 and the print copy here for AUS$17 includes GST. Here’s how the book is described by the publisher. One note to North American readers – it’s written appropriately in the Queen’s English. English parish records are a fundamental source for English research. In this detailed guide, family historian Paul Milner explains how and why the records were created, beginning in 1538, what the records look like and what information they contain. A well-illustrated case study, with plenty of twists and turns, shows why care is needed to trace back in time from one generation to the next. The guide continues by explaining how and where to access the records (online, microfilm, originals or in print) and concludes by explaining what to do when you can’t find your ancestors in the records. 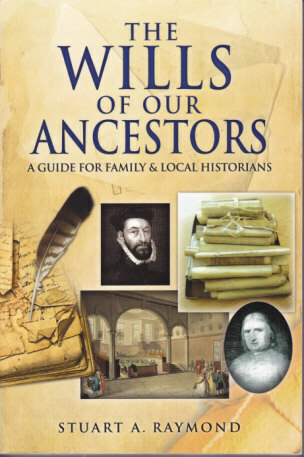 The Wills of Our Ancestors: A Guide for Family and Local Historians. By Stuart A. Raymond. Published by Pen & Sword Family History, 47 Church Street, Barnsley, South Yorkshire S70 2AS, UK. www.pen-and-sword.co.uk. ₤12.99. US Distributor: Casemate Publishing, 1016 Warrior Road, Drexel Hill, PA 19026. www.casemateathena.com. $24.95. Australia Distributor: Gould Genealogy and History, P.O. Box 119, St. Agnes SA 5097, Australia. www.gould.com.au. AUS$34.95. 2012. xviii, 199 pp. Illustrations, index. Softcover. Almost every book on English research highlights the need to examine the wills of our ancestors. But the devil is in understanding the details and there are lots of them. Mr. Raymond gives us an easy to read detailed guide to understanding and using the wills and associated records of our ancestors. This book focuses primarily on English and Welsh probate records from the medieval period through to 1857, although the post 1857 wills, along with the parts of the British Isles are discussed, but in less detail. The book’s introduction discusses the value of probate records, what has survived, their origins (separate meaning of will and testament and how they got combined after 1540), probate law, along with their limitations and biases, plus a community case study. That is all in the introduction. There are separate chapters addressing: who could make wills and why they made them; the probate process; what is likely to be found in the will (and why it needs to be treated with care); the contents, value and limitations of inventories; other probate records (litigations, act books, commissions, administration bonds, probate accounts); plus where and how to find the probate records. The book continues but with less detail on the post 1857 wills, and probate records from around the rest of the British Isles. There are a number of other groups of records outside the church and civil courts that contain probate materials and these are each addressed giving the researchers alternative sources. There is an excellent further reading section that provides an annotated bibliography of books about the probate process, records, and guidebooks but also identifies published collections of probate records arranged by counties, and specific locations within the counties. The problem is that the listing is not complete and you might not know that unless you read everything because in the annotated section for the book by Gibson and Churchill it states – “This volume also lists numerous indexes, both published and unpublished, which are therefore not listed in the present volume” (p.109), although some of the publications in Gibson and Churchill are included here. The appendices include: summary lists of pre-1858 probate courts, arranged by county, which can be complicated and the author makes no claim for total accuracy; guidance of where to find assistance with handwriting and Latin; a glossary of terms found in probate records; Latin glossary; and a very useful listing of legislation affecting probate. Pen and Sword have hit another home run, with another great addition to their family history series. This book will be of value both to the beginner and the more experienced researcher. Given my last post about the indexing of WWI war diaries, I was in this post going to explain how to download the war diaries that had already been scanned and were available as part of The National Archives website. I had downloaded war diaries in October 2013, but I can’t do it now. I thus spent the week learning a little more about what is happening regarding digital images at TNA. Firstly, I learned that the war diaries are in the process of being digitized at a higher quality. They will then be repackaged, improved and put online again. I suspect with a different fee structure. I also learned by reading the minutes of the TNA User Advisory Group that changes are coming to the Digital Microfilm currently available online for free. It is the Army Lists in WO 65 that are specifically mentioned in the minutes. I confirmed by contacting a committee member that changes are coming. Specifically WO 65 will be removed, repackaged and put online for a fee. Nothing was disclosed about what the repackaging what look like, what the fee would be, or when this would occur. It was suggested that if I wanted copies of the Army Lists for free that I should do it soon. To get to the complete list of Digital Microfilm click here. This will take you to a description page and a long list (getting shorter) of digital microfilm that you can download free from a variety of record groups. Scroll to WO 65 – Printed Annual Army Lists. The published army lists begin here in 1754 with WO 65-1 and end chronologically with 1878-79 WO65/163. However, at the end of the chronological lists are an additional five films of British American Half Pay lists and Foreign Corps. What is different about these printed Army Lists is that they are the ones that were actually used by the War Office. These volumes are annotated, often indicating changes for you to look for in the following year. The published annual Army Lists is often the first primary source you will use to reconstruct the promotions for any Army Officer. It is thus a valuable source. I am not suggesting that you download every volume available. These can be very big files. What I am suggesting is that you may want to consider downloading the volumes for any specific period in which your ancestor/s may have served. In addition to that I am also downloading sample volumes from other periods so if I later find or suspect another family connection I can dip into the lists for free. I understand that there will be a charge in the future. Have a look at the rest of the digital microfilms to see what others may be of interest to you and get them now. Some of them are fully indexed in the Discovery catalog – WO 76 – Records of Officers Services. As an outsider this would be another obvious one for a commercial partner to index, slice and dice and of course then charge you to access the record. Have a look at the Digital Microfilms, which are currently free and see what might be beneficial to your research.